What's new: This work profits of recent updates to Spark metrics instrumentation, notably SPARK-22190, SPARK-25228. It also builds on top of the ideas of this previous work by Hammer Lab. Dashboard view: The following links show an example and general overview of the example dashboard, measuring a test workload. You can find there a large number of graphs and gauges, however, this is still a selection of the many available metrics in Spark instrumentation.The test workload is Spark TPCDS benchmark at scale 100 GB, running on a test YARN cluster, using 24 executors, with 5 cores and 12 GB of RAM each. 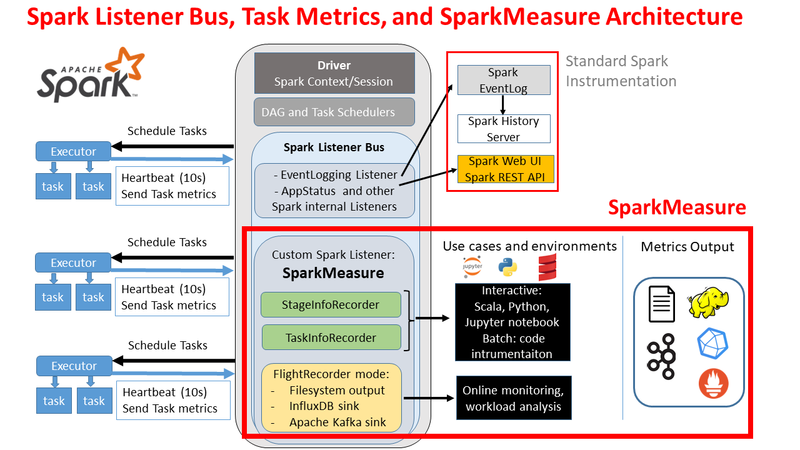 You find in this post the details of how to build a performance dashboard for Apache Spark workloads. The dashboard can provide important insights for performance troubleshooting and real-time monitoring of Apache Spark workloads. The implementation on Spark metrics system integrated with InfluxDB and Grafana. In addition you can find links to details of the available metrics instrumentation, configuration details for InfluxDB and examples of Grafana dashboard and graphs that you can use as a starting point for further exploration.